General Hospital (GH) spoilers tease that there are some surprising new developments at the ABC soap. The latest comings and goings news reveals that a beloved popular soap vet is joining the cast. 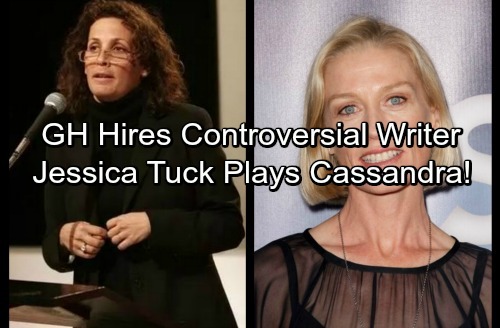 Jessica Tuck will play Cassandra Pierce, an elite criminal who happens to be a hypochondriac. She’ll kick things off on September 20 when Anna (Finola Hughes) and Finn (Michael Easton) arrive seeking info. If you were a One Life to Live fan, you probably remember Tuck as Megan. Many viewers will recall Megan’s lupus fight and heartbreaking death in 1992. Tuck continued to make appearances as Megan’s ghost until OLTL’s cancellation, but she’s had plenty of primetime performances since then. Tuck has appeared on shows like True Blood, Scandal, The Night Shift and Major Crimes. As for Tuck’s return to the soap world, she’ll be playing an intriguing character. Anna’s certainly hoping Cassandra can supply the dirt on Valentin (James Patrick Stuart). Will Cassandra fall for Finn and Anna’s ruse? Stay tuned to see if any suspicions emerge. General Hospital spoilers state that a writing shakeup has been announced as well. Daytime Confidential is reporting that a controversial executive is making a soap comeback. Barbara Bloom has been hired to write outlines for ABC’s last remaining daytime drama. Unfortunately, many viewers blame Bloom for other soap-related catastrophes. Bloom was the senior vice president of CBS Daytime when Guiding Light and As the World Turns were given the boot. She also orchestrated writing changes that proved disastrous for The Young and the Restless. Naturally, fans are voicing their concern over Bloom’s hiring on social media. With only four soaps left, we all want to protect them and make them the best they can be. However, Bloom obviously won’t have the kind of control she had as a top executive. An outline writer still has to answer to GH’s head honchos. Besides, maybe Bloom learned from her mistakes. For better or worse, Bloom is on board and we’ll see how it goes! What do you think about Jessica Tuck’s recurring role as Cassandra? Do you think she’ll be a fun addition? Are you worried about Barbara Bloom joining the writing team or are you willing to give her a shot? We’ll give you updates as other General Hospital details emerge. Stay tuned to ABC’s GH and don’t forget to check CDL often for the latest General Hospital spoilers, updates and news.